Haverhill-UK is the definitive information site for the Haverhill area and one of the eastern region's leading websites. What’s more, our team are dedicated to continually enhancing the content of the site and its services, with a focus on up-to-the-minute innovation. Online advertising is increasing in popularity and effectiveness every day. Online ads are a great tool for branding and can also encourage users to click through to your website in a search for further information which frequently translates into real sales. Haverhill-UK offers a range of promotional opportunites for your business or organisation. Whether you are looking to attract the attention of the general public, other businesses or both, we have a package for you. WOULD YOU LIKE TO REACH 16,000 PEOPLE A MONTH? WE CAN! NOW YOU CAN TOO! Just take a look at our incredible traffic statistics. Over 40,000 visits in June alone! Haverhill-UK offers a range of advertising solutions including opportunities for targeting traffic. Many visitors to the site are seeking specific information and not merely skimming through like a newspaper. Advertisers can take advantage of this by choosing to target certain groups. For example, a photographic studio might opt to advertise on the photo gallery page rather than on an unrelated page such as the message boards. There are many different sizes of banners currently running on the net, however to maintain appearance of the Haverhill-UK site we currently only run one banner size. The standard 468X60 is the most commonly used size on the internet as it states a point but doesn’t swamp the whole page with graphics. Placement on the Haverhill-UK site will be on a page-by-page basis situated at the top. If you don’t have a suitable banner we can design you one for a small cost. Every page can be outfitted with your banner but some pages may be more effective than others. Popular pages at the moment are: The Index Page, Message Boards, Business, Employment & The Haverhill TV section. Discounts are available for multiple pages or entire sections. Please contact us to discuss. 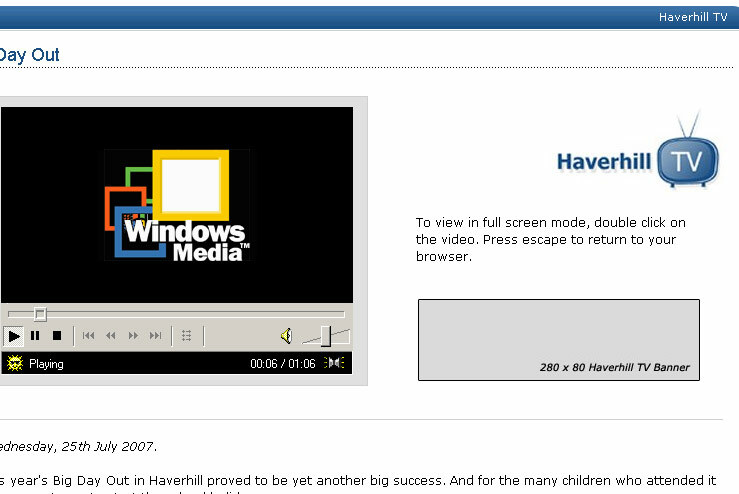 This advertising service gives you a 280 X 80 pixel banner on the Haverhill TV Video pages. When a page loads users will be watching a video right next to your ad, making it impossible to miss! For an example please click here. You can submit 'advertising news' on behalf of a company. The news item can contain up to 500 words, one colour picture, and be linked to your website or email address. We reserve the right to retain editorial control and may refuse publication of any news items at our discretion.